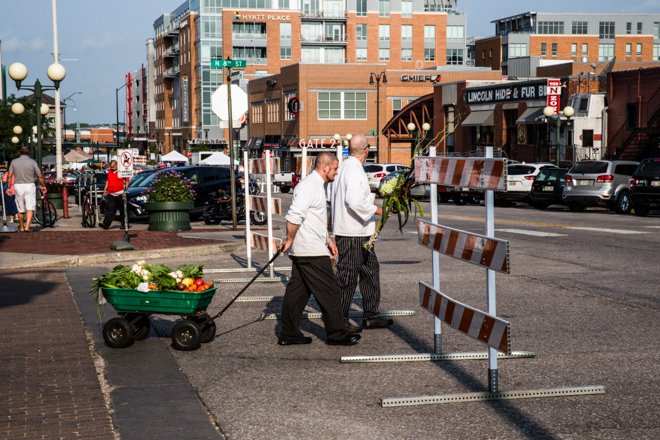 Every Saturday morning you can buy local vegetables, bread and meat in downtown Lincoln. I went there last weekend to check it out with my nieces. I brought my camera along to show you what it looks like. It is a bit like the Swedish “torghandel” but with more going on. First of all they block off the roads from car traffic so it´s in a big area to walk around on. The only vehicals there are pickups loaded with watermelons and corn and of course food trucks selling bison burgers, eggrolls and vegan cupcakes. In the picture above two chefs have stocked up on goodies for their restaurant on the other side of the street. Yes, you can buy Amish treats here too. Loving this hot pink plywood sign that a family of farmes had at their stand.